indulge: Any progress, is still progress! Any progress, is still progress! Are you ready for a half marathon recap?! Of course you are! It has been awhile since I have done a race recap so I am happy to report that I had a great run this past Sunday. 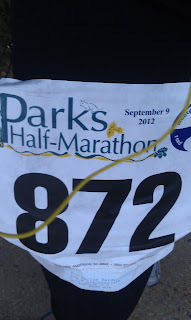 I ran in the 2012 Parks Half Marathon that started in Rockville, MD and ended in Bethesda, MD. I ran this race in 2011 so I was prepared for the course and had a time in the books to beat! The race started at 7 am which meant an early morning for me. I have run plenty of half marathons prior to this but for some reason I was nervous about this race the night before. I didn't sleep at ALL. I had that fear of sleeping through the alarm, or not having time to take the dog out, or not having time to cook myself breakfast...all these things running through my head until my alarm went off at 5 am. Luckily the race day adrenaline helped mask any fatigue and I was out the door with plenty of time to spare. The weather could not have been more perfect. It was crisp fall morning. People were even bundled in jackets prior to the race. Nothing screams long runs like a cool morning. Besides the logistics of actually getting to the race on time, I was actually nervous about running this race. I have not been doing a great job of weekend longs run or even week day speed workouts, so I wasn't hopeful for a great performance. I just went out with the goal of clocking 10 min miles and aiming to stay under 2:15. Normally, I do not care about pace groups. I usually rationalize that all I need is my garmin to know my pace and know how fast or slow I need to run, but this time I put myself between the 2 hour and 2:10 pace groups. Boy, what a difference that made! People were passing me all around. Normally, I try to break free from the group to make room for myself but I couldn't keep up with anyone. So I did my best to find a comfortable pace and stay with the group the best I could. 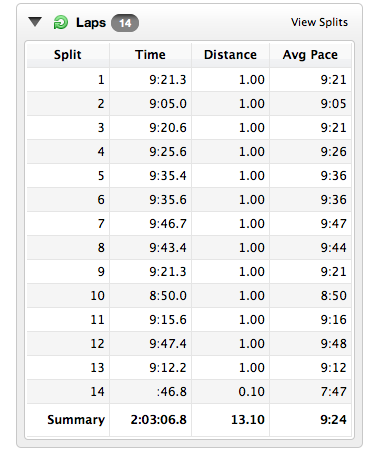 I was doing pretty good at keeping a 9:30 mile/min pace. I think the pace group really helped me keep up the speed and not slow down even though I would get tired. 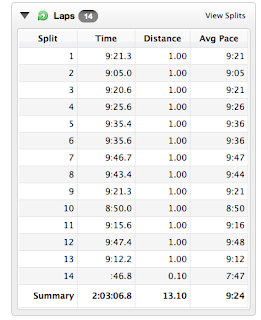 I was impressed that I was able to keep this pace throughout the entire 13 miles! There were a few hills that slowed me down, I stopped at every water break, and my hydration belt fell off 3 times. So there were certainly a few things that slowed me down, but I did a good job of picking people out in front of me, catching up to them and then leaving them behind! I picked off one. at. a. time. As you know, I have a goal of running a half marathon in under 2 hours. Well, I am sad to report that it did not happen this time. I finished at 2:03. I was SOOO close and was so disappointed when I watched the 2:00 come and go on my Garmin. But despite not meeting my goal, I was still really happy with my time. I set a new PR for my half marathon time (previous PR was 2:08) AND I ran this exact same race last year and finished in 2:27. Now that is improvement!! Big time! So I will take that and be very happy about the progress I am making. Now I just have another excuse to sign up for another half marathon and do a better job of training! I just need to chip away 3 mins, easy, right?! So another half marathon in the books! It was a great morning and I crashed pretty hard after the race and possibly finished a whole watermelon by myself. It was well earned! Overall it was a strong run, there was great weather and I had an exciting finish. It was also the motivation I needed to keep moving forward with my plans to run the Marine Corp Marathon next month! October will be here soon, I better get running.